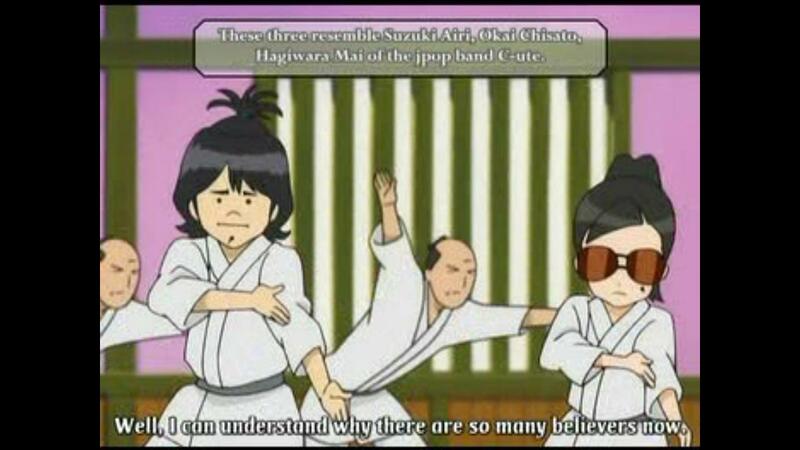 I’m currently re-watching old episodes of Gintama. I’ve known that there are various cameos of Hello! Project artists in there. There is a cameo of I think Sayumi posing with her tradenmark Usa-chan Peace and the cameo of Berryz Kobo in their handshake event for a concert tour in episode 18. But by the time I got to episode 36, I totally forgot that this is the episode where Airi, Chisato and Mai from °C-ute makes a cameo. The cameo is complete with guys who danced a part of Massara Blue Jeans. And by the time I got to episode 93, I thought I saw a cameo of both Berryz Kobo and °C-ute. So I rewinded it and pause the screen to get a close look. 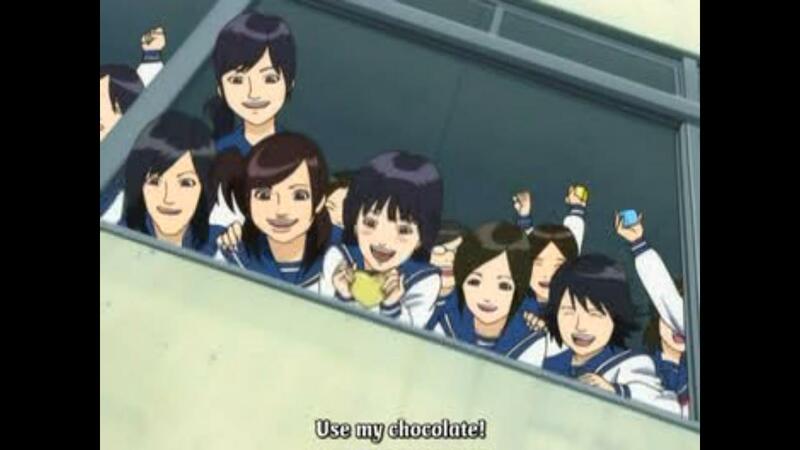 Here is Chisato (the one screaming on the left), I think Airi (middle) and Nakajima Saki (beside Airi on the right). I don’t know if the others are the rest of °C-ute because I think it does not resemble them. And here is Berryz Kobo. 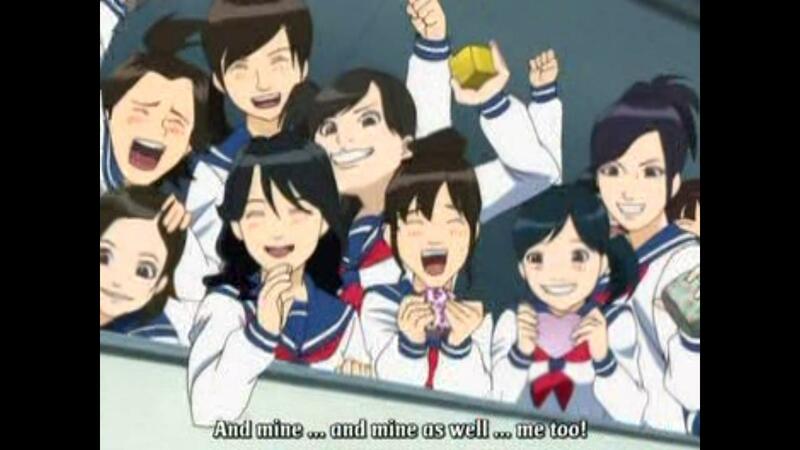 From the left is Miyabi, Kumai(above), Maasa, Momo, Captain and Chinami. I really think it is them. Though the fansubber didn’t include a note that they are indeed Berryz Kobo and °C-ute. Ooh, I can’t wait to get to these episodes! I started in the middle, and then I got the first DVD… just skipping around. Thanks for shedding a light to who the girls are. I’m just sad that Gintama ended at episode 201. I just hope the anime will return. I’m sure it will return! The director said it is only half way finished, so I’m looking forward to it. I look at the break positively, as time to catch up with the episodes during the summer. I really hope it will return soon.. And there’s the movie which retells my favorite arc.. I want to see it so badly. Don’t worry, it probably won’t reappear in the July-August season, but maybe it it will return for the fall season. If it doesn’t come back by next spring, then I’d be sad. I want to see it, too! I haven’t got to that arc yet through my skipping around. So far my favorite arc has probably been the one where Hijikata was cursed and Itou betrayed the Shinsengumi. Then again… I like pretty much anything that focuses on the Shinsengumi. Is that the arc that Hijikata became an otaku because the sword he used was cursed? That was a good arc. Yeah! That arc had great action. Yup.. And it’s so funny too.. The way Hijikata acted as an otaku..
*nods* Gin-san’s confrontations always contain a lot of heart. 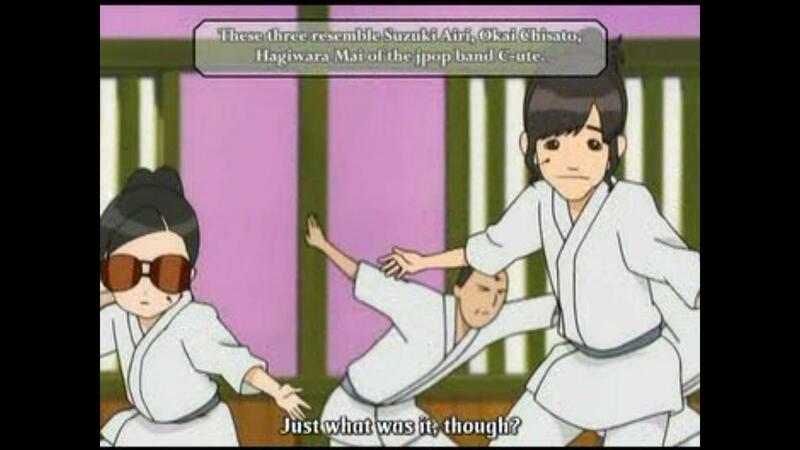 Yup… It’s really cool… I always loved it when they are referencing from other shows.. Like the Hajime no Ippo reference where Otae-chan used the Dempsey Roll, which is Ippo Makunochi’s technique, on Kondo..
And I really like the toilet humor, which requires no special in-jokes to get. I finally got to that sand paper episode… hilarious! And a few episodes before, where Kondo pooped and tried to blame it on the gorilla. Yup.. So funny… Wait till you get the part when Gin-san and Katsura was cursed to be a cat and Kondo was cursed to be a gorilla.. That one was so hilarious..
Kind of like Ranma 1/2? I’m looking forward to it!